China's Tiangong-2 space laboratory for astronauts launches into space atop a Long March 2F rocket in this view from Jiuquan Satellite Launch Center in northwest China on Sept. 15, 2016. China's Tiangong-2 space laboratory is seen ahead of launch in this still image from a China Manned Space program mission overview video. The Tiangong-2 space module launched into orbit Sept. 15, 2016 and will be visited by a two-man crew for 30 days during China's planned Shenzhou-11 mission. Those astronauts, who have not yet been publicly identified, will stay aboard Tiangong-2 for 30 days, conducting a series of experiments in biology, physics and space medicine, Xinhua reported. In April 2017, China's first cargo ship, Tianzhou-1, will dock with Tiangong-2, delivering fuel and other supplies to the space lab. The 34-foot-long (10.4 meters) Tiangong-2 looks a lot like China's first space lab, Tiangong-1, which launched in September 2011. Chinese astronauts visited Tiangong-1 on two different occasions, spending about eight and 12 days aboard the lab in June 2012 and June 2013, respectively. Tiangong-1 ended its operational life in March of this year and will likely fall back to Earth in the second half of 2017, Chinese officials have said. Tiangong-1 served primarily to prove out space-docking technologies. Tiangong-2 features improved living quarters and life-support infrastructure, facilitating longer stays by visiting crewmembers, Xinhua reported. "The launch of Tiangong-2 will lay a solid foundation for the building and operation of a permanent space station in the future," Wu Ping, deputy director of China's manned space engineering office, said during a prelaunch briefing Wednesday (Sept. 14), Xinhua reported. 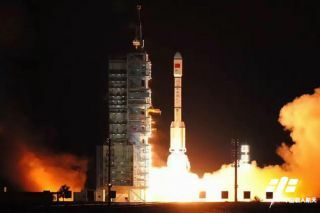 China's human spaceflight program has now entered a "new phase of application and development," she added.